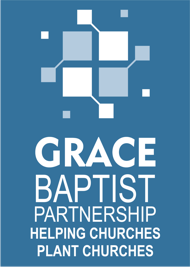 Our Church shares with others across the country through Grace Baptist Partnership. 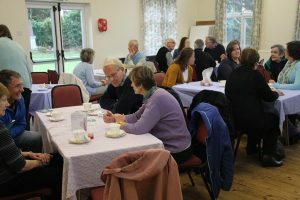 We gathered with representatives from many of those churches on 9th March, in the Baptist chapel in Dunstable, Bedfordshire for a “Prayer and Praise Gathering”. We heard news from works in Linslade, Hitchin, Halling, Ryarsh and North Watford when pastor Barry King of Dunstable interviewed members from those churches. 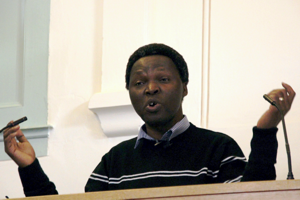 Closing, Pastor Hezron Muwowo, the pastor of the church in Leagrave preached to us from 2 Corinthians 1:8-11, giving four main points outlining Paul’s teaching in that passage under the headings Trouble, Trust, Triumph and Thanks. We were then able to share informally with many during the refreshments that followed the service. A small group of Church Members met for a social time over a meal at Hartford Mill. Unfortunately some were unable to be with us due to outside events. Members of our Church also belong to the Huntingdon Support Group for Caring For Life, a charity based in Leeds. Caring For Life distribute Christmas parcels of food and small gifts to very needy individuals and families in that city. It was decided to hold a ‘Christmas’ event in October to raise funds for that effort. A Tea/Coffee/Cakes event was held in the back hall of Warboys Baptist Church through the kind offices of that Church. We were very thankful for those who supported the event and who gave so generously to the cause. We were pleased to share this time together in this service of thanksgiving for the good gifts that God has supplied to us and the wider world. 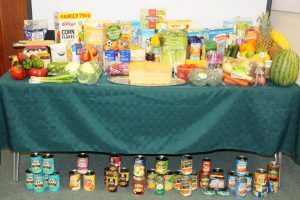 As in previous years we donated the dry good to the Chatteris Food Bank and the fresh items to a local Care Home in Chatteris. This year we were pleased to be able to welcome a returning friend from the USA who was visiting family in the town. The service was followed by a bring-and-share-lunch. At least, the slightly less serious part of our Annual Church Meeting when the statistics for the sermon downloads from the Church website were reviewed. 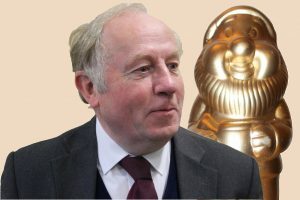 Once again, it was our pastor, Robert, who was awarded the Golden Gnome for the sermon preached 11th June 2017 entitled “The Christian Hope”. His sermon “The Genealogy Of Grace” based on Matthew 1:1-17 still outstrips others for the number of downloads since we started uploading them to the web. 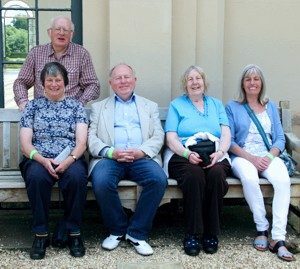 The Church enjoyed a day out together by visiting Wrest Park in Bedfordshire. This property, relatively recently brought under the stewardship of English Heritage, is well known for its gardens which surround it. The main house has little of the original furnishings, but is beautifully set off by the large lawns and lakes which can be viewed through the windows from there. We were able to stroll leisurely round the grounds exploring the different features, able to chat away without feeling crowded in by others or by anyone falling into the lakes. The weather was really fine, and so we were able to eat lunch outside the café, pleased to be in the shade of a large parasol. For once, the crumbs were not being picked up by small birds, but by a flock of jackdaws. Again, we were thankful for the protection from the parasol, this time from the attention of the birds!